In this series, we review restaurants from an entirely vegetarian angle. While some restaurants will be specifically vegetarian, others will be mainstream. We'll be tasting everything from veggie burgers, to posh meat-free menus. Along the way, we'll try to find out, as far as possible, whether chicken stock, cheese made from animal rennet, gelatine, fish sauce and so on are not lurking in the supposedly vegetarian dishes. The House of Ho is a hoot. You can tell by its name. Is this Modern Vietnamese restaurant, which opened in Soho earlier this year, alluding to Ho Chi Minh City, or the country’s best-known dish, pho? Or perhaps it’s a nod to the location itself, or the area’s more, erm, insalubrious businesses? We have no idea – but there are certainly a lot of ‘hos’ to reference. 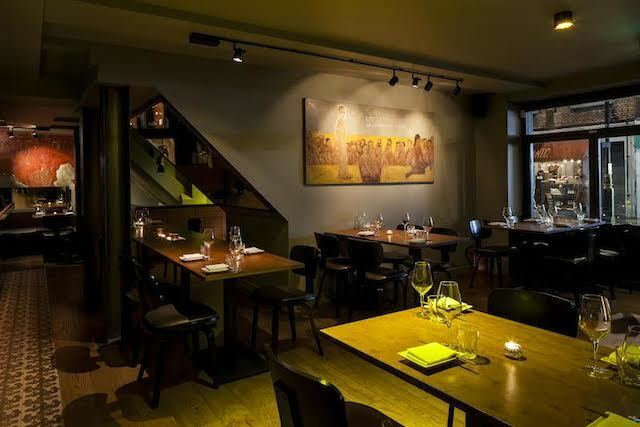 It’s owned by one of Asia’s best-known celebrity chefs and TV personalities, the Egyptian-Chinese Bobby Chinn, who owns restaurants in Hanoi and Shanghai. This is his first London venture. 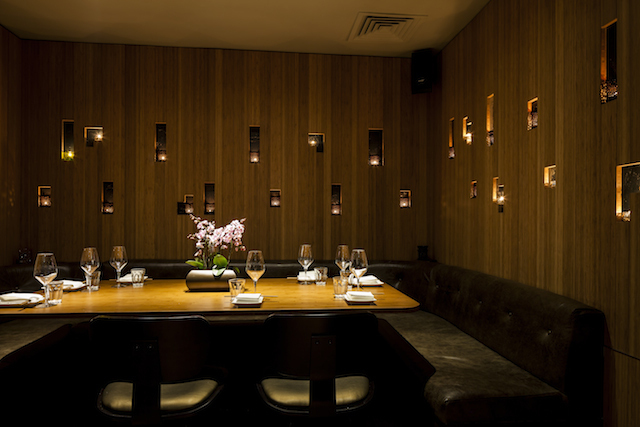 The spacious, sultry interior is dimly lit with moody lighting and flickering candles. There’s a slick bar, but only for dispensing drinks, there’s nowhere to sit down. Elsewhere there are several different seating areas, some separated by screens or curtains. Cream-coloured, plaster-effect walls are decorated with graffiti-like murals – presumably to create a ‘Vietnamese market’ effect – and contemporary art. Even on an early weekday evening, there was a lot of bustle and buzz. It’s a slickly run operation, with exceptionally on-the-ball staff who’ve clearly been trained in charm school. Can we have a better table? No problem. Our Vietnamese coffee is cold! Here’s another one. Only being abruptly brought the bill at the end, after being politely told that somebody else was waiting for our table – the better table that wasn’t ours to begin with, where we’d lingered for some three hours, with a second cup of coffee drip-drip-dripping almost in slow-mo through the filter – dampened the mood a little. But only a little. Our overriding feeling was that of pure enjoyment. So what about the food? Like many ‘sharing plates’-type establishments, the menu is divided somewhat confusingly into arbitrary sections. ‘Light and raw’ has only one veggie dish, ‘hot and grilled’ two; plus there’s one main and a few sides that are suitable for non-meat eaters. We would like to see more veggie choice on the menu (which, to be fair, is pretty concise to begin with), but we’re told that 60-70% of the items can be adapted. At the time of ordering, you’re asked if you have any dietary requirements or food allergies. Moreover, a separate vegetarian menu can be put together upon request. Unlike some of the more traditional mom-and-pop Vietnamese joints in London, the veggie dishes here don’t have fish sauce or shrimp paste lurking in them – they’re made with suitable substitutes. Pho cuon rice noodle rolls are soft without being slippery, stuffed with smoked wild mushrooms, perked up with coriander leaves and Vietnamese mint, and sprinkled with crispy fried shallots. The mushrooms, we’re told, are smoked in a Combi oven containing a smokery lined with Canadian maple chips. Their distinctive flavour further benefits from a lively chilli dipping sauce. A single pillowy cushion of soft silken tofu, stuffed with mixed mushrooms and cellophane noodles, sits elegantly in a pool of robustly-flavoured chilli-tomato sauce. Strewn with coriander leaves, it tastes vibrant, and is skilfully made (it’s not easy to stuff tender, wobbly tofu). 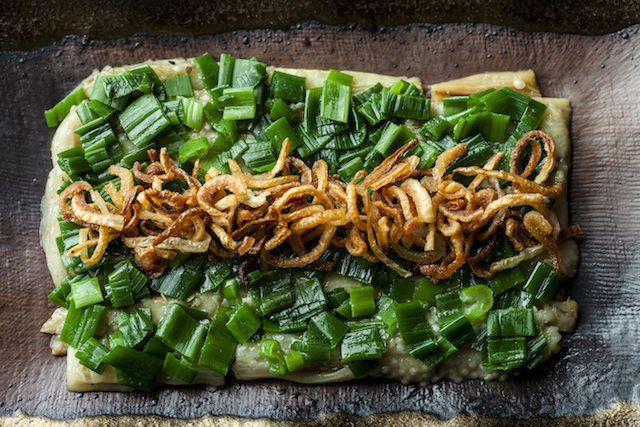 Long strips of peeled roasted aubergines garnished with shredded spring onions and crispy shallots are similar in taste to Middle Eastern meze dishes, and no less delicious. A waitress pouring ‘scallion vinaigrette’ from a miniature container at the table adds a bit of theatre. Chayote (pear-shaped pale green squash) stir-fried with eggs, coriander leaves and, yes, more crispy shallots are wonderfully earthy. Typical to the cuisine, the abundant use of fresh coriander, basil and a variety of different mints lifts the flavours; but too many crispy shallots, though they provide textural variation, bring a touch of bitterness and mask the dishes’ subtleties and aromatic qualities. The only real disappointment is the star main dish of vegetable curry. Fashionista-sized baby aubergines, potatoes, okra, carrots, pumpkin, pearl onions, spring onions and baby sweetcorn are somewhat hard and undercooked; and the aubergines are bitter. The coconut gravy is under-seasoned and bland, and the curry is served on superfluous rice noodles. (The aromatic jasmine rice is a much better accompaniment). Despite the welcome crunch of coarsely crushed roasted peanuts on top, the dish doesn’t quite come together. Trio of strawberry, passion fruit and intriguingly flavoured lemongrass ice creams, served in a martini glass, are fine. Like some of the other dishes here, they’ve been given the sous vide and Pacojet treatment. There’s technological razzmatazz in the kitchen, which has experimented with various different equipment and temperatures to approximate the sort of flavours and textures you’d find in Vietnam. The food is beautifully presented on artistic Asian stoneware and pottery. From a comprehensive drinks list strong on wine and sake, we loved the Asian-influenced, vodka-based cocktails flavoured with lemongrass, coconut, chillies, rose and lychee. We paid around £40 each, including drinks and service – very reasonable for a trendy central London venue. Although it’s a rare smart Vietnamese in London, The House of Ho isn’t original. 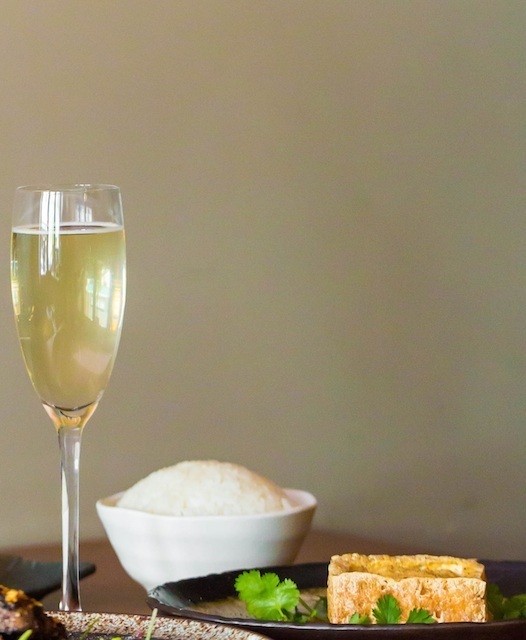 There were hip fusion-Asian restaurants springing up 15 years ago serving prettily plated small dishes – similar in spirit, but focused on Thai and Japanese fare fashionable at the time. Ho doesn’t pretend to be ‘authentic’, but it has an authentically big heart. It’s a crowd-pleaser with a relentless feel-good factor. It’s a Hollywood blockbuster movie, not a French film with subtitles. You’ll leave with a smile. The House of Ho, 57-59 Old Compton Street, W1D 6HP. Tel: 020 7287 0770. Images kindly provided by the restaurant.